This is a sequel of the film ‘Wall Street’ that was released in 1987. Michael Douglas reprised his role as Gordon Gekko, a role which won him his Oscar for Best Actor, and there is also a cameo appearance by Charlie Sheen as well, reprising his role as Bud Fox. The story here takes off 23 years after the events of the previous installment revolving around the financial crisis in 2008. 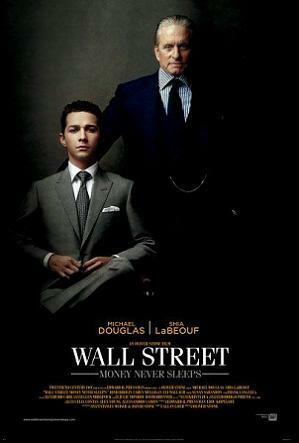 The movie focuses on Jacob Moore (played by Shia LaBeouf), a young ambitious trader who is marrying Gekko’s daughter. He seeks revenge for his mentor’s death with the help of the Gekko but in return, he must help Gekko reconcile with his daughter. Well well a sequel after like what, 23 years? Seemed as though they’ve ran out of any good new ideas. The first film was such a hit, I didn’t even know about it at all until I saw the trailer of this sequel. Wall Street offered moral values & inspiration to all ambitious working young adults. But as for this sequel, it has a very different approach. It’s nothing more than just a drama to me. One that involves family values and stock market/business. The film is certainly not as great as the original although Gekko’s lines here are still quite intelligent. My friend, Taipau, said that it’s actually quite educational as well. I agreed. Verdict: A decent sequel but lacks of the elegant elements and qualities of its predecessor. I’m just pleased that the plot is different.